I gave this presentation, Website Mistakes Small Businesses Make, and How to Fix Them, at WordCamp Grand Rapids 2014. I’ve seen many small businesses make website mistakes that hurt their results. My presentation was about how to fix these mistakes so your site delivers business results. Below are the video, slides, and detailed notes. Chad Warner at WordCamp Grand Rapids 2014. Photo courtesy @WCGrandRapids. How many of you have small business websites? What is the purpose of your website? Business websites exist to sell, directly or indirectly. Businesses have goals for their site, such as convincing prospects to hire them, request a quote, purchase a product, etc. Businesses often lose sight of this and get caught up in the visual design (logo, colors, fonts, etc.). They ask for a website that “pops” rather one that sells. There are several items that go into optimizing a website to sell. These can include items related to the website itself and items related to marketing the website. I’ve divided them into categories: content, design, marketing, and technical. Small business websites are often full of long, eye-glazing paragraphs describing the company’s history, culture, mission, products, and services. The focus is on the company, not the visitor. There’s nothing to excite the visitor or get them to take action. Content refers to the text, images, and video on a site. Effective content is content that accomplishes goals. For a marketing site (one that markets a business’ products or services), a goal might be to have a visitor request a quote. For an e-commerce site, a goal might be to have the visitor purchase a physical or digital product. Effective content will persuade visitors to perform actions that lead to these goals. This requires calls to action: text, images, or videos that prompt the visitor to take the next step towards the goal. Each visitor is asking, “what’s in it for me?” as they browse your site. Create content that answers that question, and you’ll have effective content. Businesspeople think they can write, so they don’t see a need for a copywriter. The truth is, you and I have seen far too many small business websites with spelling and grammar mistakes, and long, boring paragraphs. In addition, most people don’t know how to write persuasive marketing copy, or write for both humans and search engines. A web copywriter can proofread, convert long, boring paragraphs into concise, persuasive writing, and write with SEO in mind. In short, a copywriter can help create effective content. Many small businesses don’t feature blogs, often because they say they don’t have time to blog. Blogs have many advantages: they help build relationships, establish credibility, aid in marketing, and have SEO benefits. Search engines (such as Google) like fresh, frequently updated, keyword-rich content. Posts are great content to share on social media. Share posts yourself, and encourage readers to share them. You can also share in email marketing. Establish authority and become known as an expert. You can create your own niche. By providing informative content, you may win readers over without needing to “sell” to them. Reveal your personality and connect with readers on a human level. Comments give people an opportunity to ask questions directly in a comfortable way. By replying, you show that you’re approachable. You can also build a community through comments. For more, see my post Why your business website needs a blog. Fortunately, WordPress makes it very easy to blog. If you don’t have the time, I recommending finding someone in your business who does, or hiring a freelancer. It’s usually painfully obvious when a small business site includes stock photos. The worst ones are shots of people who aren’t employees or customers of the business. It’s especially bad when the models in the photos are demographically different from the business’ actual employees or customers. Part of a website’s job is to make a business seem authentic and credible, but stock photos of strangers make visitors question your legitimacy. I recommend having a professional take photos of the people in your business in action. I understand a small business’ desire to appear professional, but it often results in cold, distant websites with boring copy and stock photos. Write personal, engaging copy, and include actual photos of the people in your business. You may need a copywriter or photographer, but the result is worth it. Also, reveal some of your personality (hobbies, interests, fun company events, etc.) in your pages and blog posts. You don’t need to stick to text either; use photos and video too. Small businesses often want to take all their marketing material and put it on their website. This often results in pages that are so packed with information that visitors give up before they start. I recommend giving just enough info on top-level pages (Home, About, Services, etc.) to persuade visitors to click deeper into the site. You can always give more info later, once you’ve drawn them in. Businesses are often focused on increasing traffic to their sites, and overlook how much of that traffic they’re converting into customers. Conversion optimization (AKA conversion rate optimization or CRO) is focused on increasing the number of conversions by testing different versions of pages. It’s about getting visitors to take the actions you want. While SEO and other marketing efforts are focused on increasing traffic, CRO is focused on making the most of the traffic you get. If visitors aren’t converting, it doesn’t matter how many you get. You can do some basic testing yourself, but you’ll get the best results from working with a conversion optimization specialist. The number of visitors viewing the Web from mobile devices (phones, tablets, etc.) continues to increase. If your site isn’t mobile-friendly, mobile device users may leave the site. You may lose prospects, and it’s also sending a negative signal to Google. I still see small businesses launching fixed-width websites in 2014! These sites are difficult to use on small screens, because they’re either tiny or you need to zoom in and drag around to see everything. This is not a good user experience. Make sure your site is mobile-friendly. I recommend using responsive design, meaning that your site scales to fit browser size. As I mentioned earlier, small businesses tend to focus on design over content and functionality, leading to a design that’s so busy and cluttered that it detracts from the content. The vast majority of people come to a business site for its content, not its design. Use a simple design that puts your content in the spotlight. I highly recommend working with an SEO professional on these items. This can be pricey, but well worth the investment if you consider the lifetime value of your customers. I highly recommend working with a digital marketer on these items. Any public website can be targeted by hackers. The unfortunate reality is that WordPress sites are heavily targeted by malicious bots and individuals. WP WhiteSecurity states that, “According to statistics from 40,000+ WordPress websites in Alexa Top 1 Million, more than 70% of WordPress installations are vulnerable to hacker attacks.” Your host and site admins need to be up to the challenge. We had a business come to us after their e-commerce site was hacked. They paid more to have it fixed then they would have paid for almost 2 years of our maintenance plan. We prefer to use SiteGround or WP Engine for hosting, and CloudFlare for its security features. Visitors, especially mobile visitors, don’t like waiting for sites to load. You may lose prospects, and it’s also sending a negative signal to Google. If they notice that mobile visitors are leaving your site immediately after arriving, it could negatively affect your ranking. A faster site can result in higher conversion rates and higher revenue, and a slow site could be penalized by Google, especially if it’s a slow mobile site. We had a bed and breakfast come to us because their site was loading slowly, and they were afraid that prospective guests would leave the site. In addition to a good web host, I recommend using caching and a CDN (content delivery network) to make the site even faster. Again, we prefer to use SiteGround or WP Engine for hosting and caching, and CloudFlare as the CDN. Websites can be damaged in several ways, including user error, hackers, and hosting issues. That’s why regular backups and simple restoration options are critical. Many hosts offer backup and restoration, but I recommend that you also keep an offsite backup (using Amazon S3, Dropbox, etc.) in case something happens to the host. Don’t keep all your eggs in one basket. We talked to a consulting firm that approached us after their host lost their website and had no backups. The firm was able to find some archived content, but ended up recreating much of the site. We like to use BackupBuddy to back up to Amazon S3, in addition to the backups provided by the host. The e-commerce site I mentioned earlier was hacked through a vulnerable version of TimThumb in their outdated theme. For more, see Why update WordPress, plugins, and themes? On-site SEO refers to optimization within your website, making it easier for search engines to crawl your site, and making it more likely for people to click your pages in search results. On-site SEO for WordPress includes such items as URL settings, indexing settings, page titles, meta descriptions, a sitemap, and Open Graph settings. We use the WordPress SEO by Yoast plugin to configure these. We use the No Longer In Directory plugin to scan sites for plugins that are no longer in the WordPress.org directory or haven’t been updated in over two years. I recommend replacing such plugins with ones that are actively maintained. Keep only the plugins you absolutely need installed. If you leave plugins that you don’t need activated, they’re using server resources unnecessarily. Unnecessary plugins can also cause security issues; plugins that are installed can be exploited even if they’re deactivated. So, if you don’t need plugins, delete them; don’t just deactivate them. For more, see 7 Things You Should Know About Using WordPress Plugins. Businesses often upload images that just came off a camera or phone. The images are huge (3 MB or more) and have meaningless names (e.g., IMG_3490.jpg). This is bad for performance, SEO, and accessibility. When I talk about large images, I’m talking about file size, not necessarily the dimensions of the images. Large images load slowly, especially on the slower connections common with mobile devices. They also take up a lot of space on your server, and could choke your backup plugin. 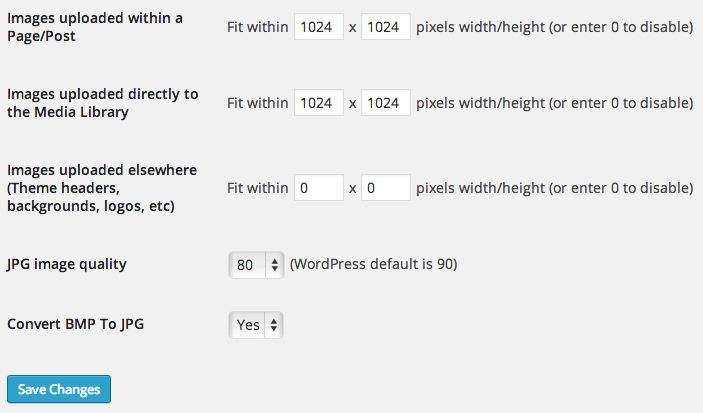 Ideally, people would resize and compress images on their computers before uploading to WordPress, but we’ve found that rarely happens. So, we install the Imsanity plugin, which automatically resizes and compress images. Images with meaningless names provide little or no SEO benefit, and the screen readers used by the visually impaired may not be able to read what they are. For the sake of SEO and accessibility, give every image a descriptive name before uploading it to WordPress, and add the title and alt text attributes. For example, a builder with a photo of a house by the lake could name the file “Holland Homebuilders large white house on Lake Michigan,” and use the same text for the title and alt text attributes. Some small businesses have a blog, but it’s not on their domain. For example, let’s say the business’ site is at smallbiz.com. They might have their blog at smallbiz.wordpress.com, or smallbiz.blogspot.com. This looks unprofessional, and it’s also preventing your domain from realizing the blog’s SEO benefits. It’s better to have the blog on your domain, at smallbiz.com/blog, for example. If your blog isn’t there already, I recommend moving it. When people share WordPress accounts, it becomes difficult or impossible to tell who did what. This can also be a security problem, because people usually end up having more access than they should have. For example, everyone shares the same Administrator account. Instead, give each person their own WordPress account with the proper role. This is very easy to do. If WordPress’ roles aren’t enough, you can use a plugin such as User Role Editor to customize roles. There are many other website mistakes small businesses make, but these are a few to get you started. Feeling overwhelmed? Take a deep breath. You may not need all of these, or you may not need to do them all to the same degree. I highly recommend hiring a company or professionals who can help you find the right mix for your business website. Do you agree or disagree with these? What website mistakes do you see small businesses make? Some great plugin recommendations! Imsanity, User role editor, no longer in directory. @warnerchad #wcgr Thanks Chad! @warnerchad Thanks for helping to organize #wcgr & for a great presentation! Nice presentation. I took some notes. I also like that you timed the slides to go up JUUUUUST as the presentation was coming to and end. Thanks for coming, Ben! I thought I’d finish a few minutes before the post was published, so I was pleasantly surprised that the timing was so perfect. Awesome presentation, Chad. Tons of great advice on how to improve traffic to sites! 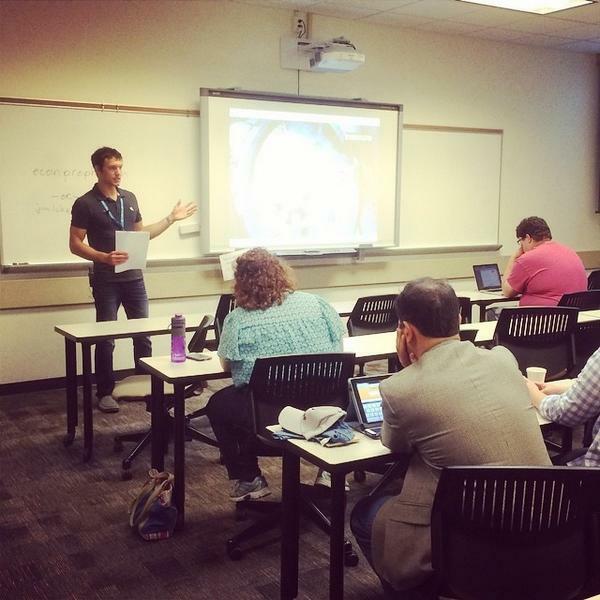 Thanks for coming to my session and to another WordCamp Grand Rapids, Eli! create results. I think for me having an ineffective content is one of the weaknesses of every website and the most reason why some websites shut down. And you are totally right on effective content will persuade visitors to perform actions that lead to the goals of your websites. Luckily, have found this link relevant to the topic and it has helped me a lot in spotting website mistakes small businesses make and how to fix: (http://smallbiztrends.com/2015/08/content-writing-mistakes.html). Thanks for sharing that article about content writing mistakes, Ana. It has valuable tips for making content (specifically, copy) more effective.